With the apparent northward movement of the sun towards the Tropic of Cancer in March, temperatures start rising in north India. April, May and June are the months of summer in north India. Dry and hot winds known as ‘Loo’, blow in the afternoon, and very often, they continue to well into midnight. Dust storms in the evening are very common in May for south-eastern areas and in June for north-western part of state. Ganganagar has about 27 days of dust-storm followed by Bikaner and Jodhpur. Duration: Season is initiated in March and prevails from April to Mid-June. Average Mean Temperature: The maximum daily temperature in the western parts of Marusthali mainly at Bikaner, Phalodi, Barmer, and Jaisalmer goes upto 40-45 deg C.
Rainfall: Sometimes, the dust storms bring a welcome respite from the oppressing heat since they bring with them light rains and a pleasant cool breeze. As a result of rapid increase of temperature in May over the northwestern plains, the low pressure conditions over there get further intensified. By early June, they are powerful enough to attract the trade winds of Southern Hemisphere coming from the Indian Ocean. These southeast trade winds cross the equator and enter the Bay of Bengal and the Arabian Sea, only to be caught up in the air circulation over India. Passing over the equatorial warm currents, they bring with them moisture in abundance. After crossing the equator, they follow a southwesterly direction. That is why they are known as southwest monsoons. (ii) The Bay of Bengal branch. 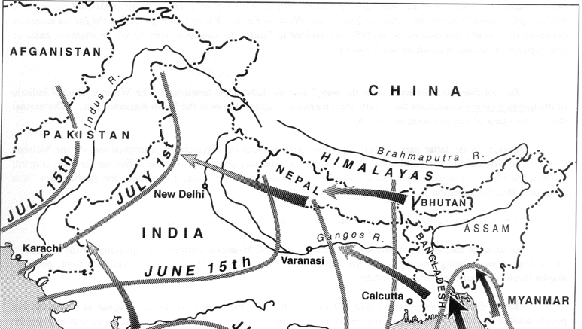 The Bay of Bengal branch already gives up its moisture during its passage through Ganga plain. Further, as Aravali range stretches from south-west to north-east direction, so western part of Rajasthan lies in leeward side of the Bay of Bengal branch and receives little or no rain from this branch. The same Aravalli Range lies parallel to the direction of Arabian Sea branch and fails to interrupt this branch of monsoon. However, in he southern Aravallis, the mountains have slight east-west span thus Mount Abu in south receives highest rainfall. Thunderstorms are associated more with eastern part of the state then the arid western areas. The months of October and November are known for retreating monsoons. By the end of September, the southwest monsoon becomes weak as the low pressure trough of the Ganga plain starts moving southward in response to the southward march of the sun. The monsoon retreats from the western Rajasthan by the first week of September. It withdraws from Rajasthan, Gujarat, Western Ganga plain and the Central Highlands by the end of the month. The retreating southwest monsoon season is marked by clear skies and rise in temperature. The land is still moist. Owing to the conditions of high temperature and humidity, the weather becomes rather oppressive. This is commonly known as the ‘October heat’. Average Mean Temperature: The temperature is fairly uniform with maximum ranging from 33-36 deg C and minimum ranging from 17 – 21 deg C. November is slightly cooler. Average Mean Temperature: Ranges from 12 deg. C in North of State to 16 deg. C in the south in January. Winds: During the cold weather season, the sun migrates to the southern hemisphere and creates high-pressure condition over the northern plain. As a result, winds start blowing from northwestern high pressure zone to the low air pressure zone over the Indian Ocean in the south. Rainfall: The pleasant weather conditions, however, at intervals, get disturbed by shallow cyclonic depressions originating over the east Mediterranean Sea and travelling eastwards across West Asia, Iran, Afghanistan and Pakistan before they reach the northwestern parts of India. On their way, the moisture content gets augmented from the Caspian Sea in the north and the Persian Gulf in the south. These cyclonic depressions have little effect in weather conditions of the state. In the Indian tradition, a year is divided into six two-monthly seasons. This cycle of seasons, which the common people in north and central India follow is based on their practical experience and age-old perception of weather phenomena. However, this system does not match with the seasons of south India where there is little variation in the seasons.